On the recent Medical Cabinet Makeover post, I had moved the top of the medical cabinet to a new base. So many of you asked "What happened to the original base of the medical cabinet?" Well, it is being used as an entry table by the front door. 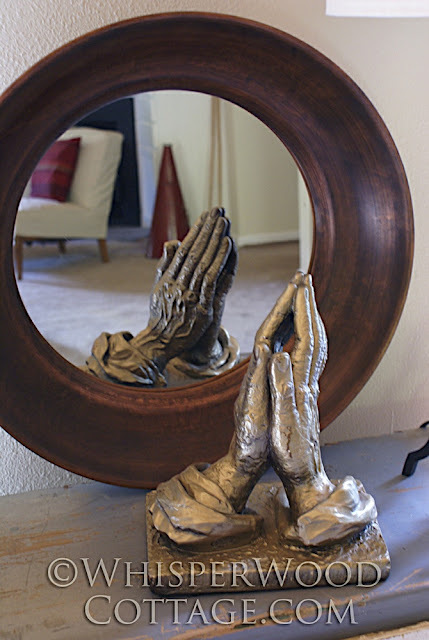 It's topped by a TJMaxx lamp (from like 10 years ago), a round copper framed mirror from TJMaxx, and some praying hands from a garage sale. What do y'all have by your front door? yes, it is right at home there. my front door I have my mother's sewing machine (in its original cherry cabinet) it was the machine that I learned on as a child and certainly wanted to keep it after my mom passed away...which makes me think - wouldn't it be great if there was a way to post a picture along with my comment in answer to your question of "what is by your front door"? It looks wonderful by your door but I would love this piece anywhere you put it. I have a petite French country bench by the front door with a couple of pillows I made with transfers. Nothing that makes a statement like this...only my old Yellow Boxes! 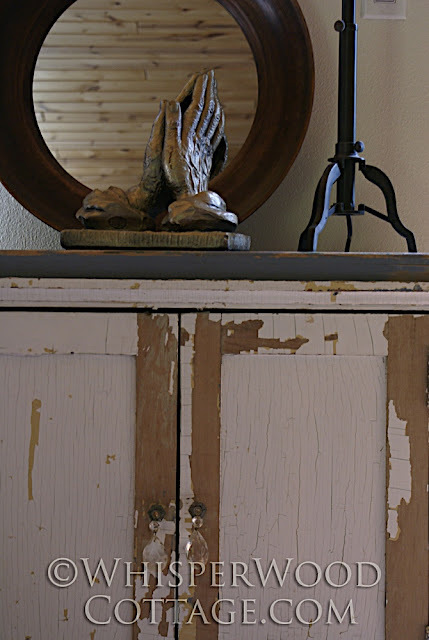 Old chippy boxes, a ceramic mirror and a holy water fount! Not big enough for a table. Just too narrow of a space so all my things hang on a wall or are put on the shelf. Yours is incredible! I have a crescent shaped mirror topped stained wood table by my front door. It's kind of hard to describe. I really like the mirror and praying hands together! My pile of shoes is no match for your entryway-it looks great! 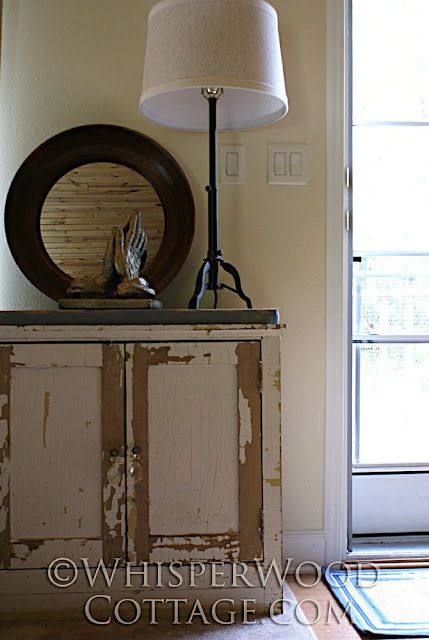 I love the rustic paint. I currently have nothing by my front door. Its such an awkward place...I need to find something!